Hello Couchers! And welcome to the May 18th edition of Tuesday Couch Potatoes where we post about a movie each week. Looks like I am running late again for my entry and I apologize for the delay. Anyway, this week's theme is Apocalyptic. If you love movies based on the revelations or the end of the world and the human race such catastrophes caused by wars, nuclear holocaust, pandemics or plague, astronomic impact, cybernetic revolt, and more, then this is the theme for you. I have seen tons of apocalyptic movies of different nature but there is one movie that I particularly love. And that would have to be: The Independence Day or ID4. 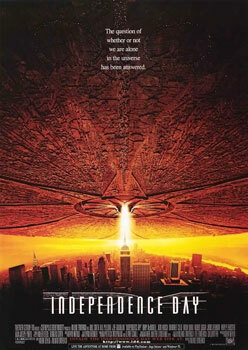 This sci-fi film came out in 1996, and is about the alien invasion to earth. What makes this movie different from other alien movies is that when the aliens arrived, they did not hide but made themselves visible... with the alien mothership 1/4 the size of our moon hovering above the New York sky. When government attempts to communicate with the aliens fail, humanity eventually found out through a scientist turned cable technician that the aliens are planning to attack the major points of the planet in less than a day. Humanity fights back on the 4th of July, fighting for their freedom. Good morning. In less than an hour, aircraft from here will join others from around the world. And you will be launching the largest aerial battle in the history of mankind. "Mankind." That word should have new meaning for all of us today. We can't be consumed by our petty differences anymore. We will be united in our common interests. Perhaps it's fate that today is the Fourth of July, and you will once again be fighting for our freedom... Not from tyranny, oppression, or persecution... but from annihilation. We are fighting for our right to live. To exist. And should we win the day, the Fourth of July will no longer be known as an American holiday, but as the day the world declared in one voice: "We will not go quietly into the night!" We will not vanish without a fight! We're going to live on! We're going to survive! Today we celebrate our Independence Day! Next week's theme: It's All About Hugh. For those huge (and not so huge) Hugh Grant fans out there, next week is your week! Thank you for joining us this week on TCP! I hope everyone is having fun and I hope to see you all again next Tuesday. Till then, take care and Happy TCP! oh this movie I remember it. ay I love this movie din, di rin ako nagsasawang panoorin to. I lvoe Will Smith namankasi talaga. Kaya nga pati MIB pinapanood ko over and over hehehe. Happy TCP mommy Kamz, hapit na sd independence day. I ahve seen this movie but wala nakuha akong interest hehehe. one of my favorite movies, I also like the part when Bill Pullman made that one of a kind speech.